I'm gonna start things off with some of my newest items since most of my collection is back in CT. 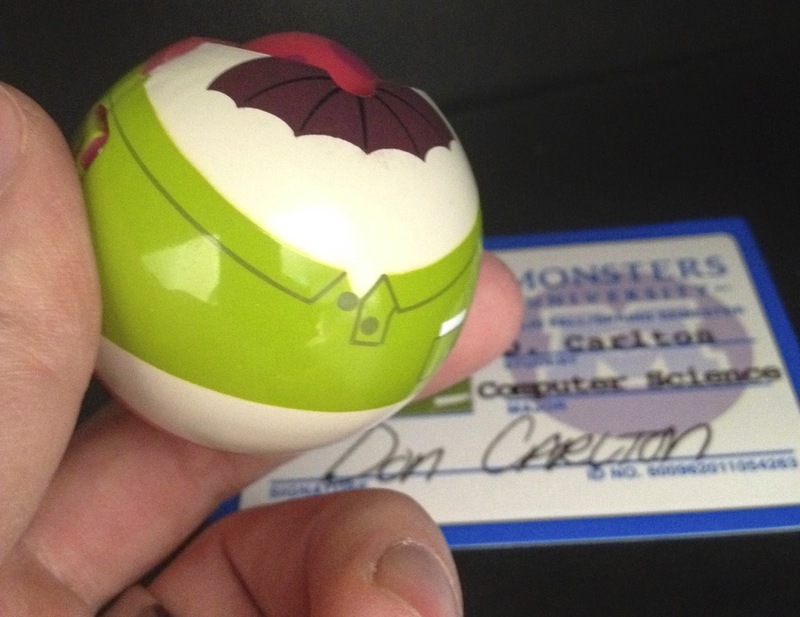 I had an amazing Monsters University birthday party in May and it was a great start to my MU collection! 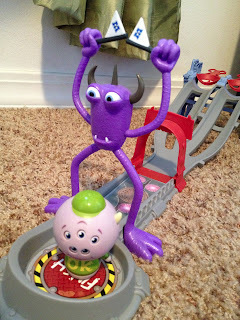 Here are one of my favorite lines...the "Roll a Scare" monsters. 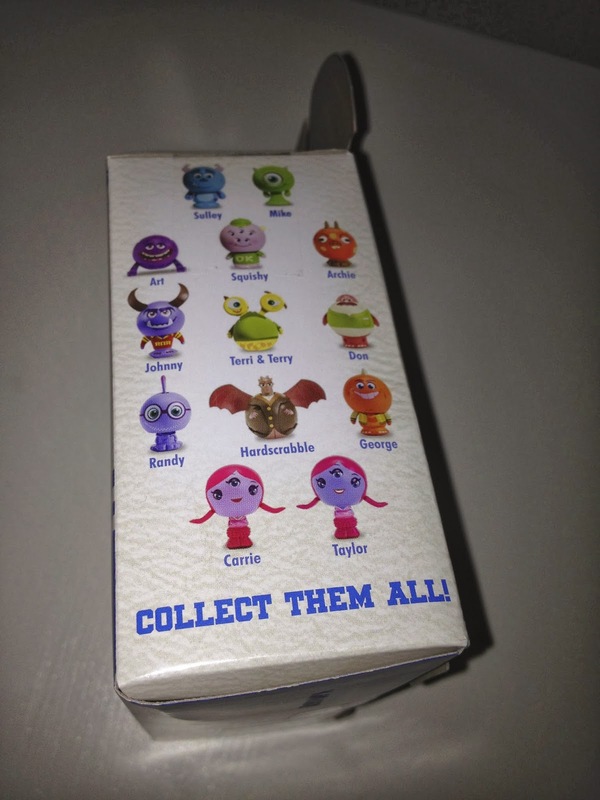 The initial characters released in May 2013 (seen above) were: Mike Wazowski, Johnny Worthington, Terry and Terri, Randy Boggs, Sulley, Art, Squishy, George Sanderson and Boo (a Toys R Us exclusive). 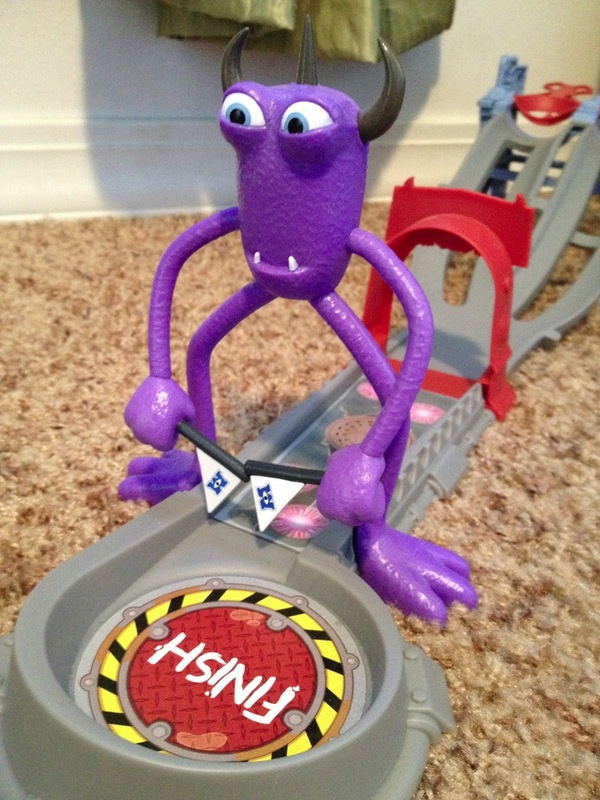 You may notice a second Mike and a second Sulley in the picture above; the Mike with MU hat came with the "Roll a Scare Bus" (seen HERE) and the Sulley came with the "Roll a Scare Toxic Race Playset" (seen below). Later on in the year (updates below), Dean Hardscrabble, Archie the Scare Pig, Carrie Williams and Don Carlton were also released. 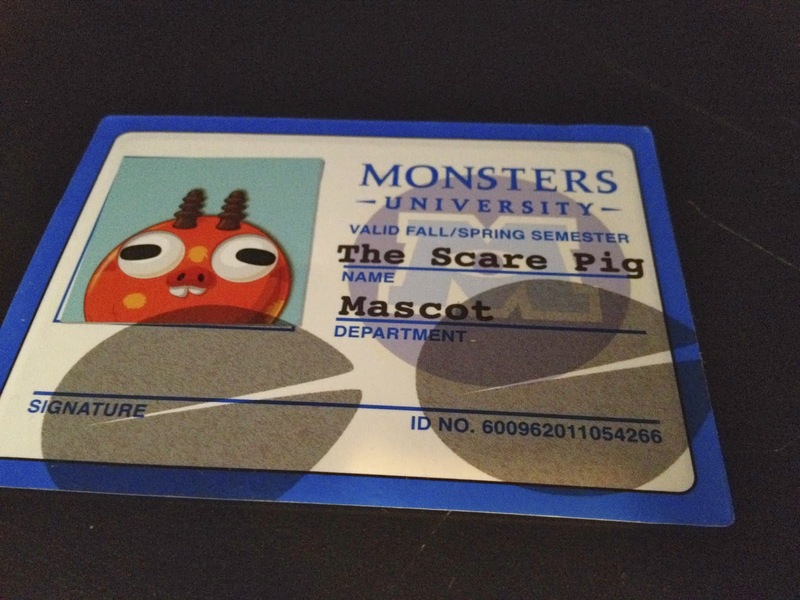 ...Then pop open when placed on one of the magnetic student ID cards (seen above) that each monster comes with (Boo comes with her door as the magnet). Check them out in action on my Vine HERE and HERE! Just click the video screen to play. 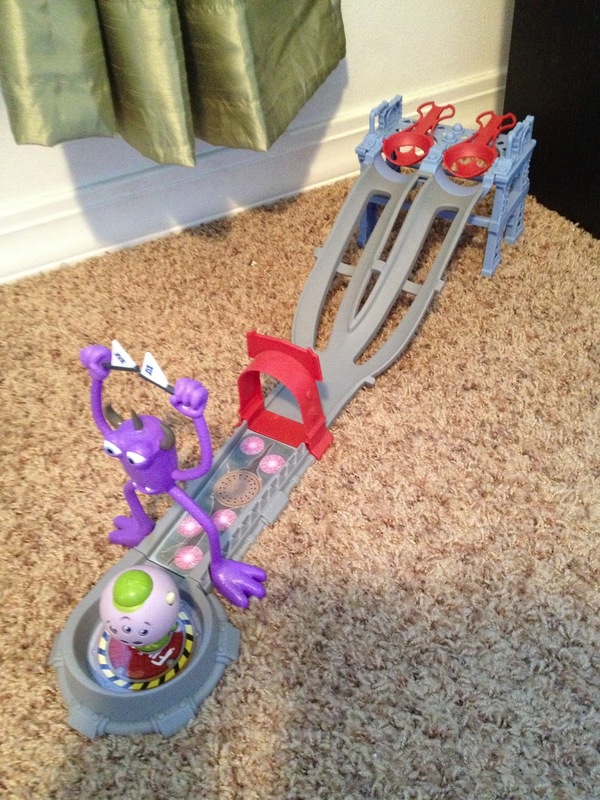 Also available as part of this collection is this "Toxic Race" Playset! You can race the characters down the ramp, over the "stinging glow urchins" and see who wins... A magnet at the finish line will make the winning character spring open! Check my brief video (also on Vine) to see how this playset works HERE. 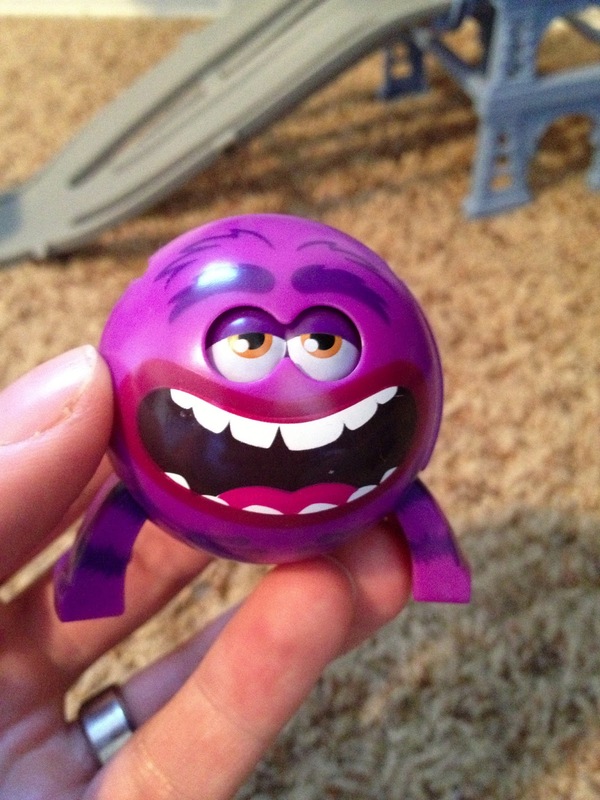 This play set comes with an exclusive roll a scare Sulley as mentioned. Again, in addition to the "Toxic Race" playset, there is also the MU bus as part of this line, seen here. 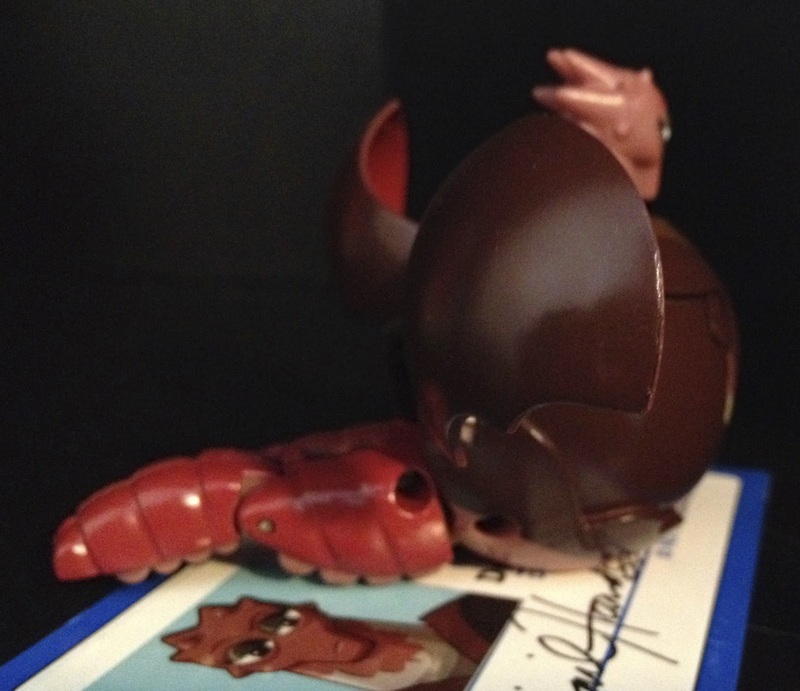 A few weeks ago near Christmas time, I was finally luckily able to find this Dean Hardscrabble Roll a Scare after searching for it for a pretty long time! I got my original ones in May for my birthday and I was anxiously awaiting when the new wave would be released. This one has got to be one of my favorites! Below is just about all of main line singles available (besides Boo, seen above in my original post, who was a Toys R Us exclusive) seen on the side of the package. 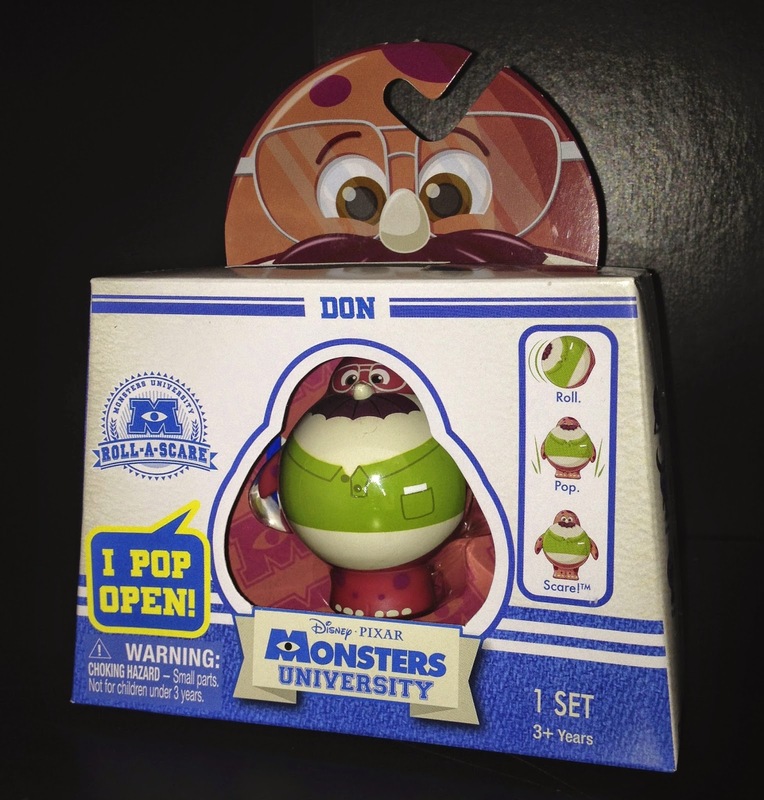 The only left that I don't have and that I'm desperately searching for is Don, which has proven to be the most difficult to find (I know he has been released because I've seen hm on eBay quite a bit selling for $20-$30). 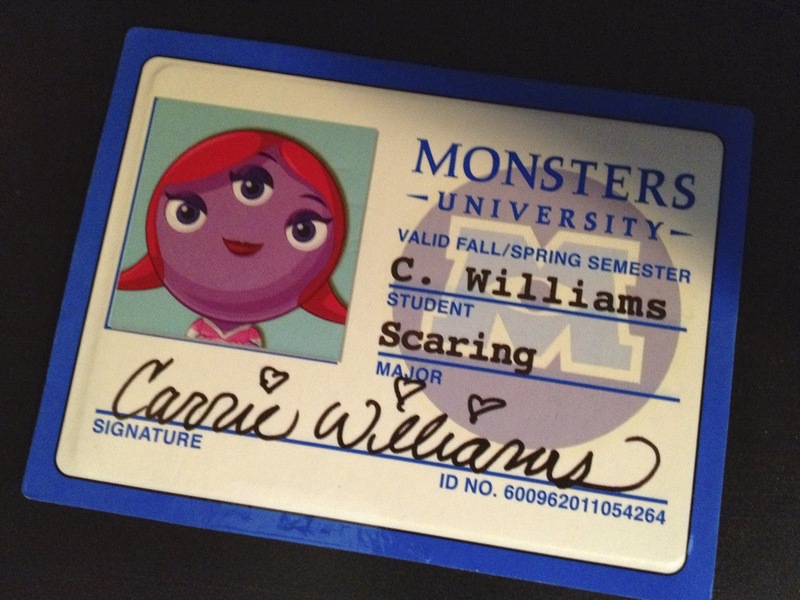 It's also interesting to note also that "Taylor" (almost identical to the Carrie character) is shown. I have heard/seen nothing about her release. There were only supposed to be 12 released initially so it's interesting that she showed up out of nowhere as part of the line. 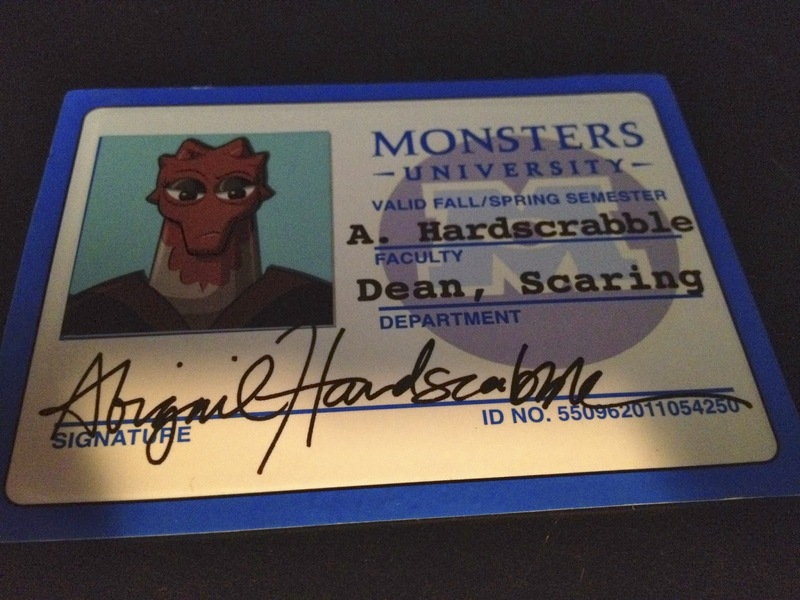 Note: Dean Hardscrabble's first name in the film is Abigail, hence the first letter initial of "A." on her student I.D. card. Check her out in action on my Vine account HERE! Back in December while I was visiting my in-laws in MD for Christmas, I did my usual trip to the local Target for a toy hunt. 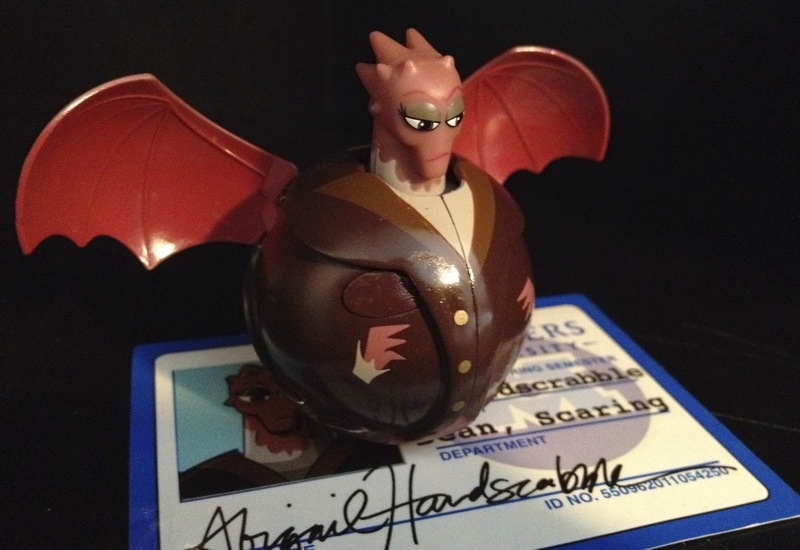 I was so happy to find Archie the scare pig (MU's mascot) along with the Dean Hardscrabble seen in the previous update. 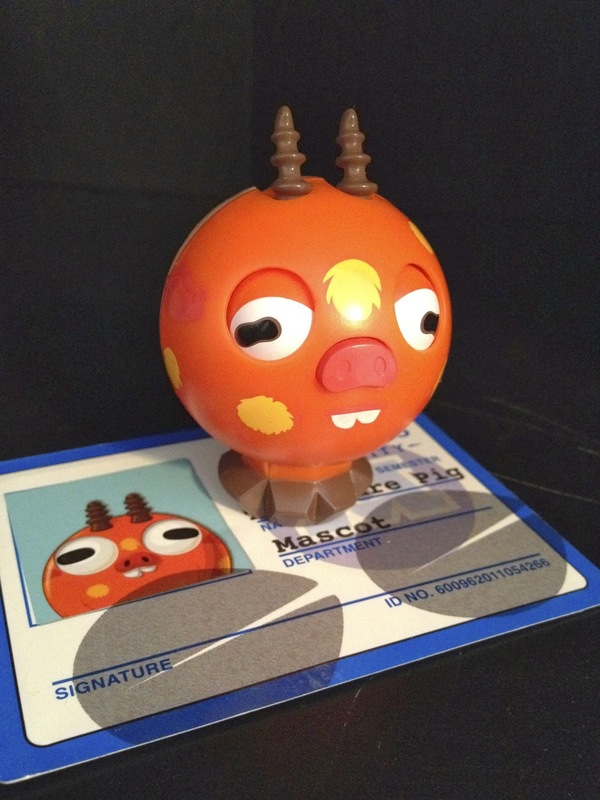 These are not easy to come by as most of the MU merch has fizzled out at this point. 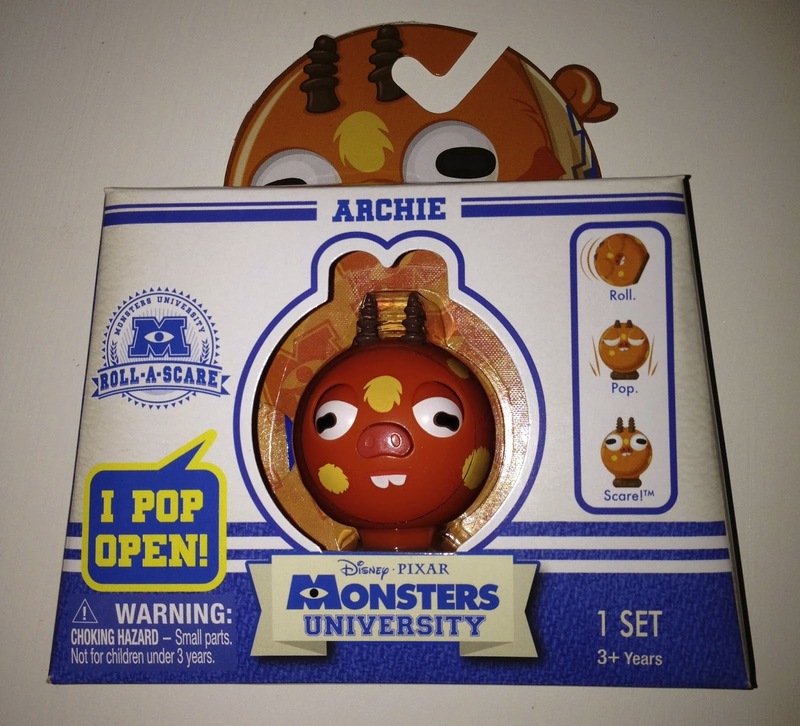 I'm really surprised there wasn't more products released for Monsters University at retail (I feel like there was more planned for the future but maybe, because they didn't sell as well as Spin Master hoped, future released were cancelled). Most of the Roll a Scares and other MU merch you'll find at the store (if any) will be the same initial released ones from last May. Most stores aren't even carrying them at this point. So anyway, I'm really happy to have found this! I really love this line and really hoped it continued into this year with even more monsters. Unfortunately I think it has come to an end. 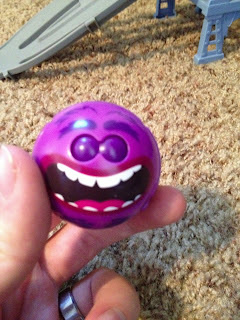 Are you a fan of the Roll a Scare Monsters? If so, which characters would you have liked to see? If I had to choose five more it would be: Chet, Mrs. Squibbles, Brock, one of the HSS girls and one of the EEK girls. Sound off your thoughts in the comments below! 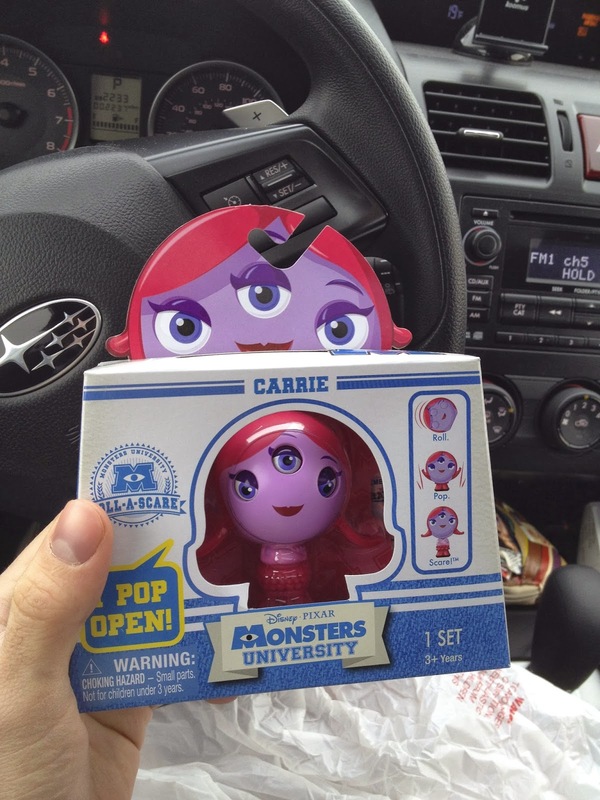 Back in December, I was lucky enough to run into this pretty rare and limited release roll a scare at my local Target, Carrie Williams from the Monsters University PNK sorority! She is not an easy one to find and have only run into her maybe once again after. 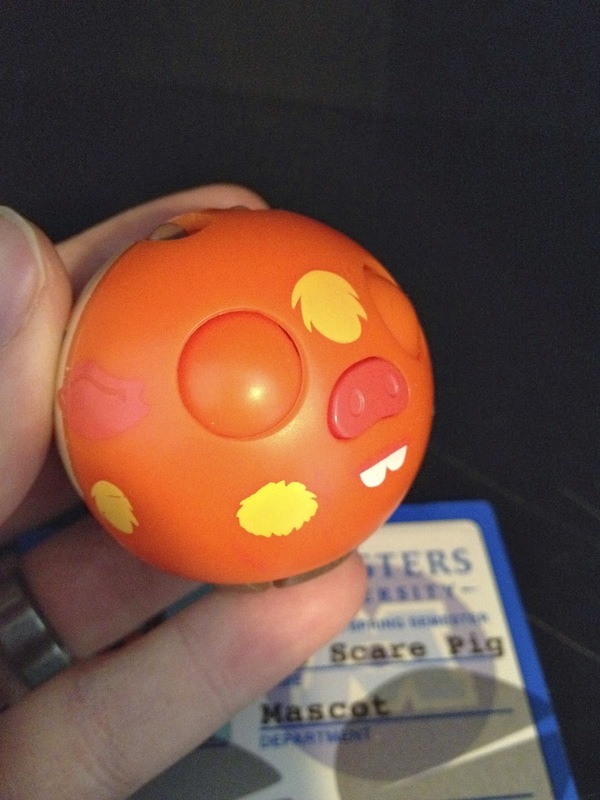 As usual with these roll a scare monsters, I love the design and how they're able to make all of the "pop out" parts fit in such a little ball. 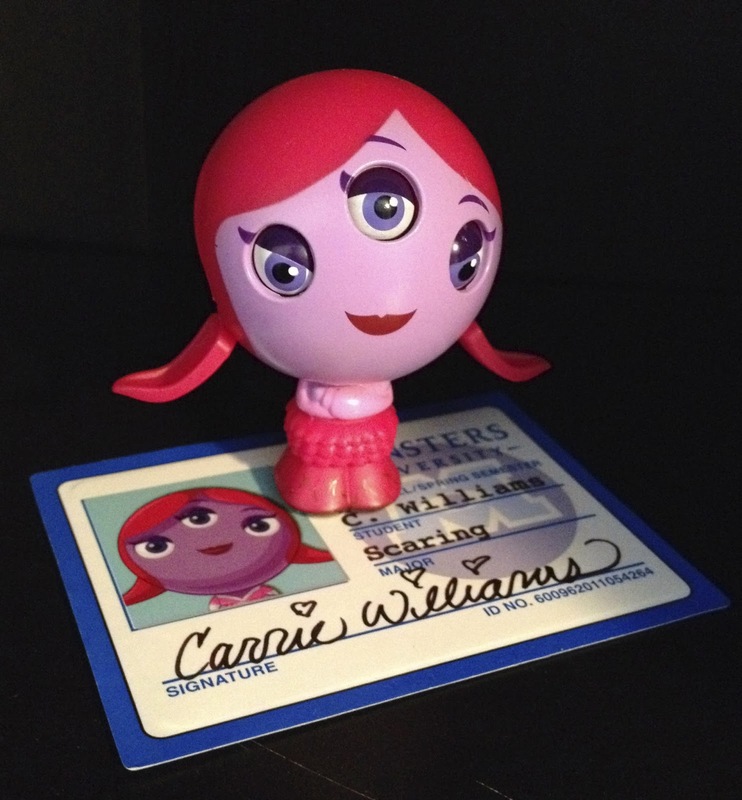 As mentioned earlier in this post (see the update with Dean Hardscrabble for a picture), the updated packaging to the roll a scare figures also shows an upcoming release of another PNK girl, Taylor, who is almost identical to Carrie here. I haven't seen or heard anything else about her, so that character may or may not have been cancelled. Of course, as soon as I know, you'll know! See Carrie and Archie in action on my Vine account here. Here it is! 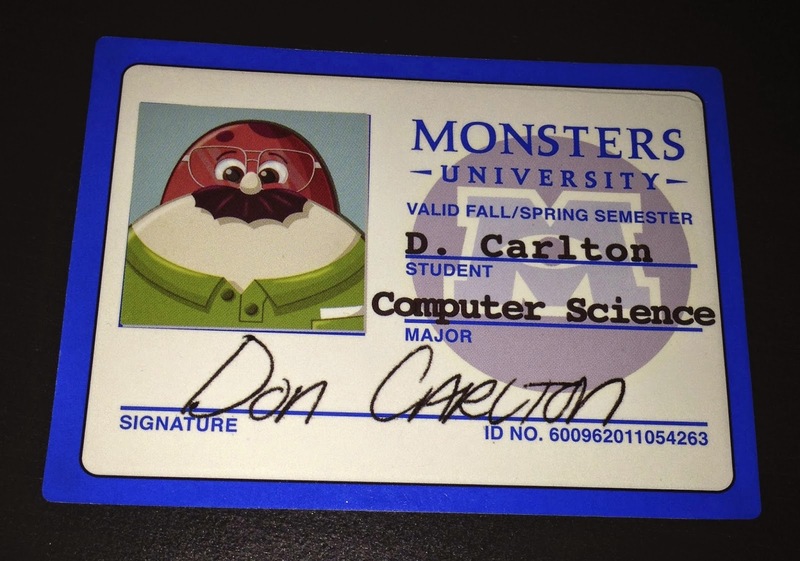 The last piece I needed for my Monsters University Roll a Scare collection to be complete...Don Carlton! This character has been the absolute hardest to find out of them all. It is not on eBay or Amazon or anywhere online to buy (that I could see). If it wasn't for my very good friend, I wouldn't have ever been able to find this. He happened to find it randomly at his local Walmart and contacted me right away about it. I was thrilled and could not believe he actually found it. A huge thanks to him for sending this over! This Don Roll a Scare is a lot of fun. The design and "pop open" feature is as clever as the rest of the collection. These have been a blast to collect and I'm really happy to have these little guys. 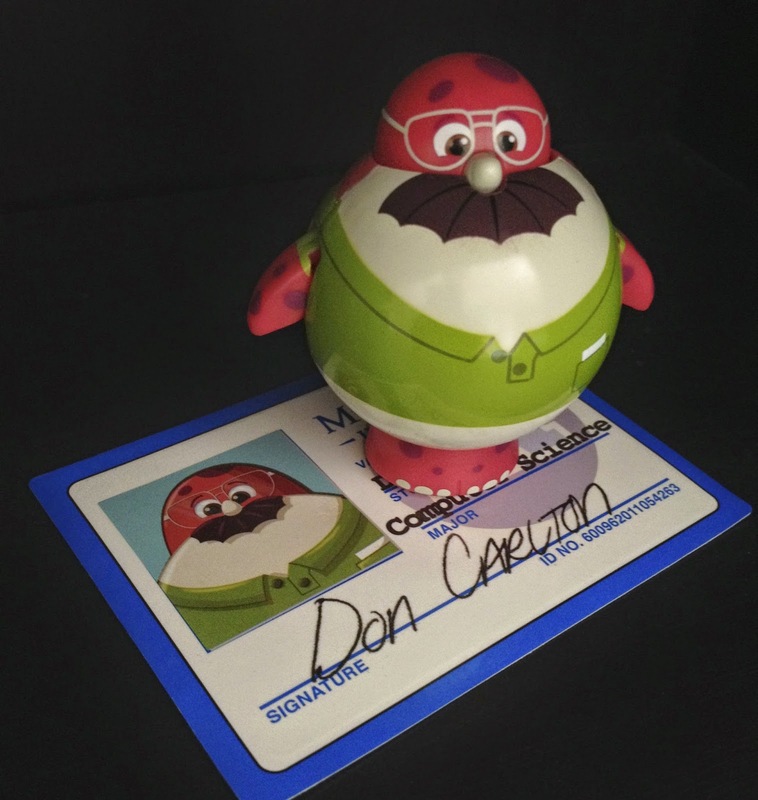 FINAL UPDATE: It seems as though Don Carlton is in fact the very last of the "Roll a Scare" monsters that Spinmaster released. I mentioned a potential release of Taylor (from the PNK sorority) a few times throughout this post, but it has been confirmed that she was indeed planned but ultimately cancelled. 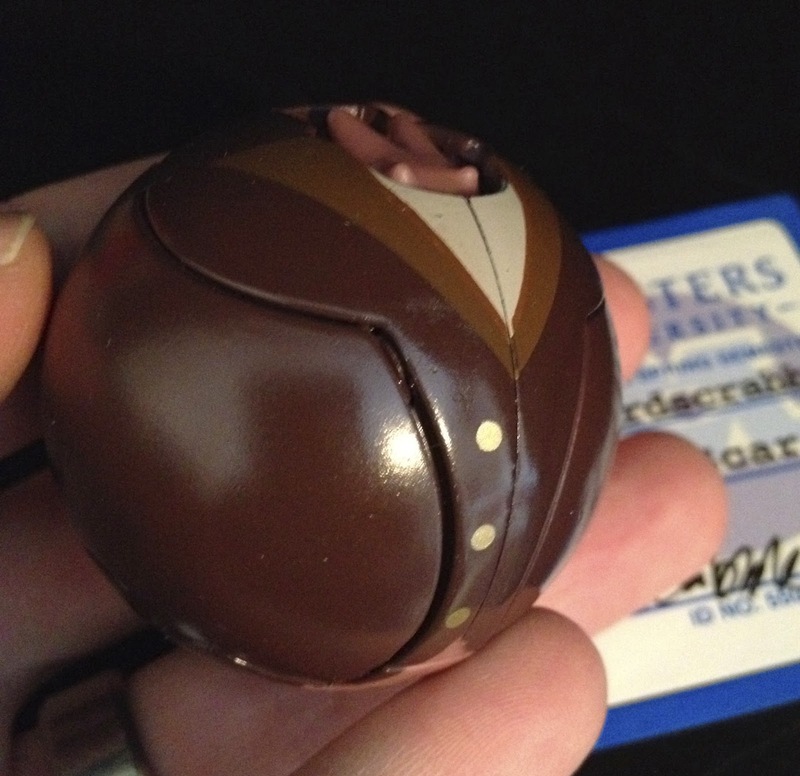 A big thanks to TJ over at the Pixar Post for contacting Spinmaster directly and solving the mystery. The bad news is one less character to collect, the great news is I can now say my collection of these are complete! I also wanted to give a shout out/honorable mention to a couple of other "Roll a Scare" products that were released in the line that I didn't get (mostly just because of lack of interest): The three "Roll a Scare Ridez" (seen HERE) and the Oozma Kappa Toys R Us exclusive "Frat Pack" (seen HERE). Wow, they had to do quite a bit of engineering work to figure out how to get her head, wings and tail all compacted like that. Crazy! That's a neat one. Also, you're right, I've never heard or seen anything about Taylor - that's an interesting one. Good luck on the Don hunt...I haven't seen any others besides the originally released set of characters in stores around me. Yah I know, it's crazy how much they fit into the Dean one! I had actually typed up a little about that but didn't include it in my final write-up. I was super impressed when I got it cause I didn't even think that the tail would be included like it is! Yah Don is nowhere to be found...not even on eBay anymore! He sold for like $30 for a time but now there's none. And yah, out here in Idaho I've never seen any that aren't from the original release back in May. Lame! 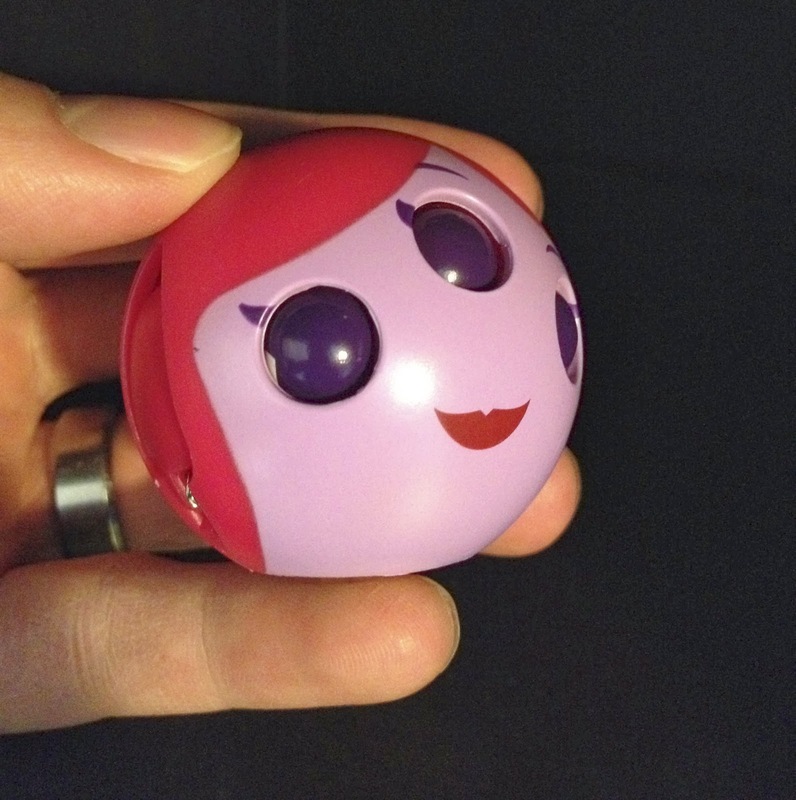 The MU merch didn't take off quite like I had hoped. Most stores around here still have some the same stuff from the release day last year! :) Thanks for the nod! I still think the Hardscrabble one may be my favorite of the bunch, but that Don one is so cool how his head pops up like that! Also, oh man - that is even going to drive me nuts thinking about Taylor and if she's out there. I can't imagine that she would still be on the list to come out since the MU toys are being clearanced out everywhere...but did she ever really exist is the question of the ages. I have an idea...I'll post back! 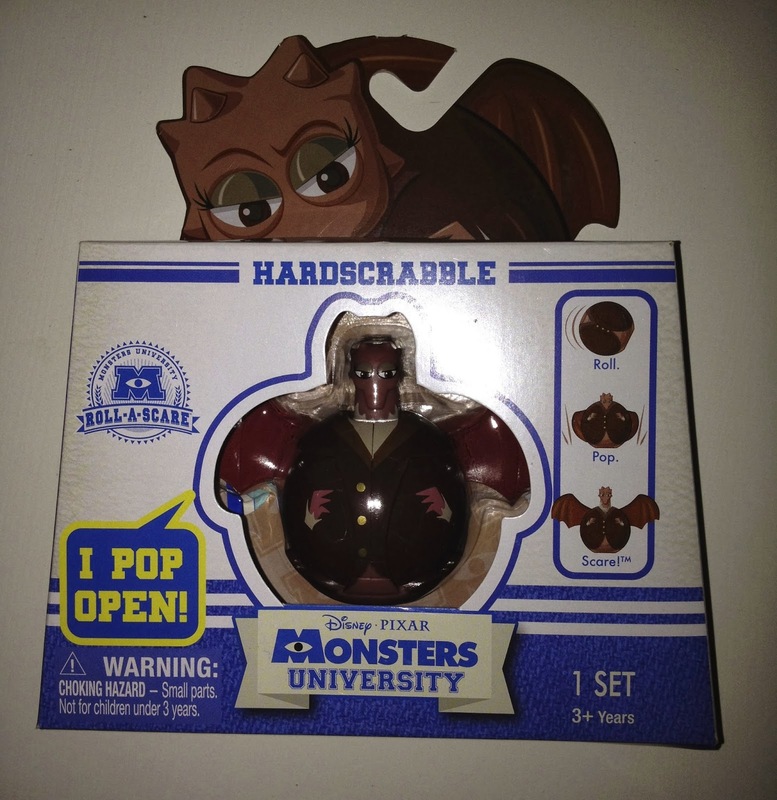 Yah the Hardscrabble and Terry & Terri ones are probably my two faves probably just because they fit the most in. And about Taylor...I think the line is done too. I'm pretty sure they've stopped production on the MU stuff and the last new products got dropped. 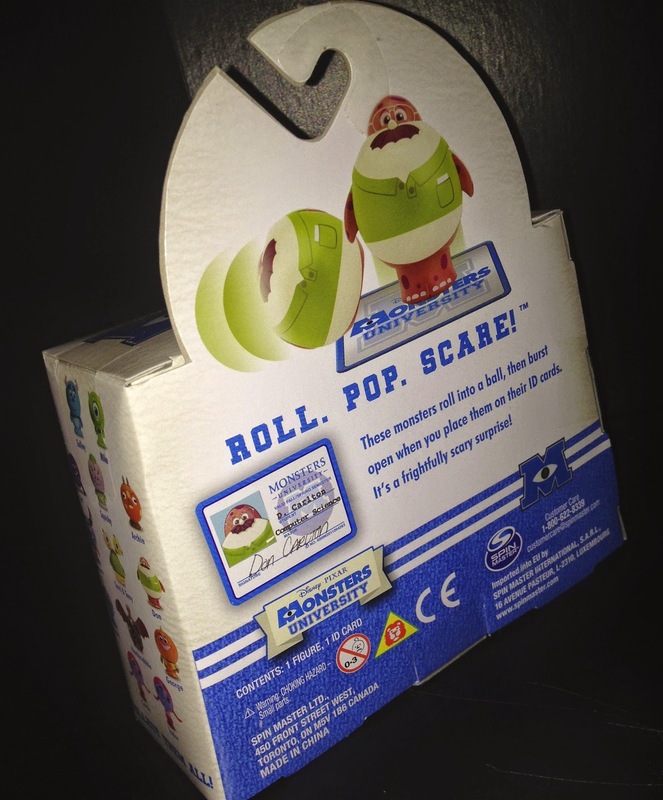 The only thing is I did find a packaged photo of Taylor (http://www.aliexpress.com/store/product/Free-Shipping-Monster-University-ROLL-A-SCARE-RIDE-SULLEY-Action-Figure-Ball-Toy-With-Magnetic-Card/722862_1115959848.html). So she did make it far enough to get packaged but I don't know! It's hard to tell. I think she may have been dropped just like the last wave of scare pairs which was supposed to Archie, Carla, Sherrie and Don. They were on the back of the scare pairs package but I'm thinking they're done cause I can't find even a little info about those online. It's too bad the MU lines didn't go for longer! It seems they were mostly done last May with initial release.